You know the adjective old applies when a band you followed as a kid celebrates its 40th anniversary! That would be the great Canadian band Rush, which will kick off its “R40 Live” tour on May 8 in Tulsa, Oklahoma. The 35 dates will end on August 1 at the Forum in Los Angeles, a venue that dominated the concert scene in 1970s LA and has only recently begun to host concerts again. RUSH has been recognized with eight Juno Awards, seven Grammy nominations, including one for the acclaimed documentary “Rush: Beyond The Lighted Stage” that also won the Audience Award at the Tribeca Film Festival. The band members were inducted into the Canadian Music Hall Of Fame in 1994, made Officers Of The Order Of Canada in 1996 and inducted into the Songwriters Hall Of Fame in 2010. They have received a star on both Canada’s Walk Of Fame (1999) and Hollywood Walk Of Fame (2010). In 2012, RUSH were bestowed with the highest artistic honor in Canada when receiving the Governor General’s Performing Arts Award. To the elation of their fans, RUSH were inducted into the Rock And Roll Hall of Fame in 2013. 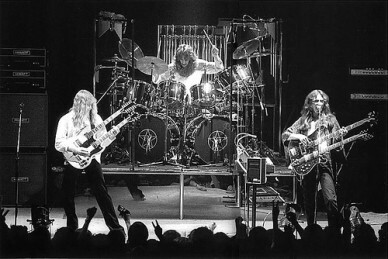 Rush is known for their complex but thunderous power-trio progressive metal sound and their intelligent lyrics, which often featured libertarian ideas and even positive allusions to the anti-communist philosopher-novelist Ayn Rand. Heady stuff, well worth looking into if you’re not yet familiar with this venerable rock band.